We have been in business for over 20 years and through that time we have excelled at providing our customers services that they need and want. We are always looking to grow and improve our product so that we can help improve your products. Precision laser cutting is just one of the many services that we offer and one of the ways that we can provide you with a superior product. You can count on our process to leave you with a clean cut, precise finished product that is ideal for your application, no matter what industry you work in. 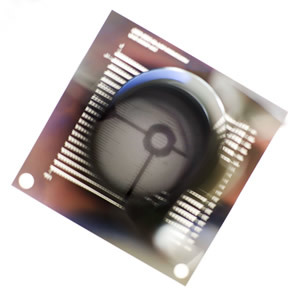 Our business was started and excels in photo chemical machining, a process that requires precision and accuracy no matter how intricate the product design may be. Precision Laser cutting is no different as it is commonly used for applications where traditional chemical etching methods cannot get the job done. The reason for this being that precision laser cutting not only is able to make the intricate cuts, it is able to make the intricate cuts without damaging the material during the process. There are numerous advantages to precision laser cutting from the enhanced cutting ability as mentioned before and the reduced part distortion to programming flexibility and a decreased risk of injury during the process. Not only is the precision laser cutting process more beneficial to both the consumer and the manufacturer, the precision laser cutting process is better for the environment than other alternatives as it involves no chemistry and other harmful byproducts. trending_upHere at Great Lakes Engineering we have been leaders in our field and have been constantly looking for new ways to expand our services, and our expertise in manufacturing thin foil metal parts and other similar products is some of the best in the business. Whether you are looking for laser cut parts from our precision laser cutting process or need a product completed that requires photo chemical etching, the experts at Great Lakes Engineering are here to help! With years of experience and knowledge, we work with a number of materials and know the intricacies of each material. If you are unsure of which process might be best for you and your application we would be happy to not only show you which process is best for you, but also explain why the process is best for you and your needs. Laser cutting works by directing the output of a high power laser, by computer, at the material to be cut. The material then either melts, burns, vaporizes away, or is blown away by a jet of gas, leaving an edge with a high quality surface finish. Our laser cutters are used to cut flat-sheet material. 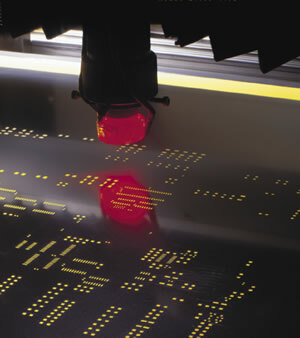 Great Lakes Engineering employs computer-controlled Lumonics Screen Cut™ lasers and a Tannlin T8-SPS to cut stencils and thin foil parts to extremely high tolerance. The process is more precise, faster, and cleaner than chemical etching. It also requires little if any post-manufacturing processing and poses fewer direct environmental concerns. Many of the same products can be manufactured using different processes. Great Lakes Engineering has the experience to determine which process is appropriate for the application, tolerances, longevity, durability and cost.